Grilled Beef with sweet soya sauce is a great choice of Indonesian Recipe for a dinner. You can combine everything with this delicious beef recipe, such as tasteful Indonesian mixed vegetable salad , or with Stir Fry Water Spinach. These are the excellent combination of oriental recipe. Choose a good and quality beef, like sirloin and you get the most out of this recipe. So the end results depend on what kind of beef you use and how long you marinade the beef. Give the time to absorb the entire flavor to get the best results. Make a mixture for the marinade. Mix coriander powder, cumin powder, minced garlic, light soy sauce, baking soda and water. Marinade the beef for at least 2 hours. 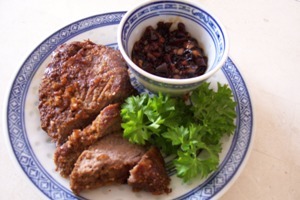 It’s better to put it in the refrigerator for a night, to let the beef absorb all the flavors. Grill the beef in the oven using medium heat. In between make a sauce to brush the meat. Mix melting margarine with shallots and sweet soy sauce. 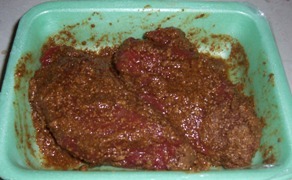 Take care to turn the beef often and brush with the sauce until done. Slice thinly and serve with sambal kecap. Do you have no time to go to supermarket? Or looking for a good quality beef without leaving home? Get gourmet beef sent right to your door! Mix all ingredients together, and you will get the most delicious and extra hot sambal kecap. And if you don’t like too hot sambal, use less Birdseye chilies. If you need some Indonesian cooking advice or looking for some specific recipe, just fill the form below. Maybe I can help you and I will contact you as soon as possible.